Tour Rider Interview: Ed Hood has been busy on the second Tour de France rest day in Switzerland, first catching up with Dan McLay and then Trek-Segafredo's Jasper Stuyven. Stuyven: Ex-junior World champion, Vuelta stage winner and tagged the 'new Boonen' but as he says, he's 'just Jasper'. Whilst some of the early stages of this Tour may have been what Aussie sprint star of not so long ago Robbie McEwen branded, ‘snooze fests’ all of the finales have been fire crackers. 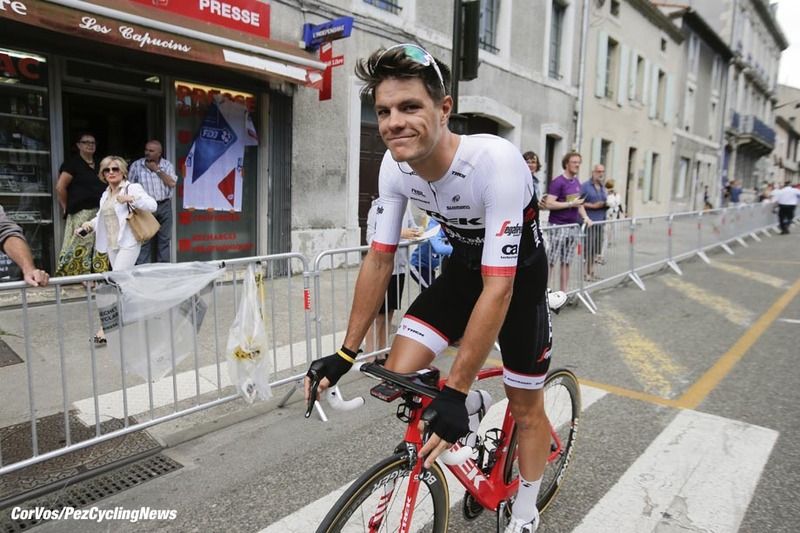 Stage Two into Cherbourg in particular was a cliff hanger with big Belgian Jasper Stuyven (Trek-Segafredo) slipping his erstwhile day long breakaway companions late in the afternoon, grabbing enough points to take the maillot a poids as best climber and only succumbing to a rampaging peloton powered by Tinkoff’s Kreuziger – on point for team mate and eventual winner, World champion, Peter Sagan – inside the flame rouge. Stuyven first shows on the radar as Belgian novice time trial champion in 2007, winning the novice’s road title one year later and by 2009 was world junior road race champion – beating Primavera winner, Arnaud Demare (F des J & France) and former Austrian road race champion, Katusha’s Marco Haller. In 2010 came the junior Paris-Roubaix and he made the podium again in the junior Worlds, bronze behind France’s Olivier Le Gac and Aussie Jay McCarthy – Britain’s Joshua Edmondson was fourth that day. In 2011 he was third in the U23 Paris-Roubaix before heading to the US for 2012 to ride for Axel Merckx’s team – as did Movistar man Alex Dowsett several years previously - winning a stage in the Cascade Classic in the USA that year and the overall in the tough Volta ao Alentejo in Portugal in 2013. It was no surprise given Merckx’s association with Trek that Stuyven signed for Trek for season 2014, riding the Vuelta as a neo-pro. He must have learned well from the experience because he came back to win a Vuelta stage last year, despite breaking his hand in a crash during the stage. This year he burst on to the stage with a solo Kuurne-Brussels-Kuurne win after finishing top ten the day before in Het Nieuwsblad despite a crash. With ‘one-and-a-half’ Vueltas under his belt this is his first Tour de France, we caught up with him at the Trek Segafredo team hotel in Bern on the second rest day. 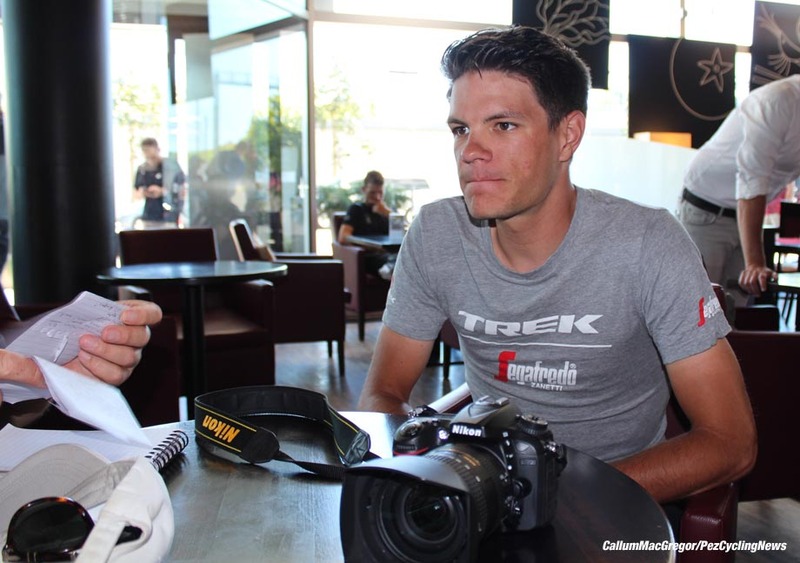 PEZ: How does the Tour compare to the Vuelta, Jasper? 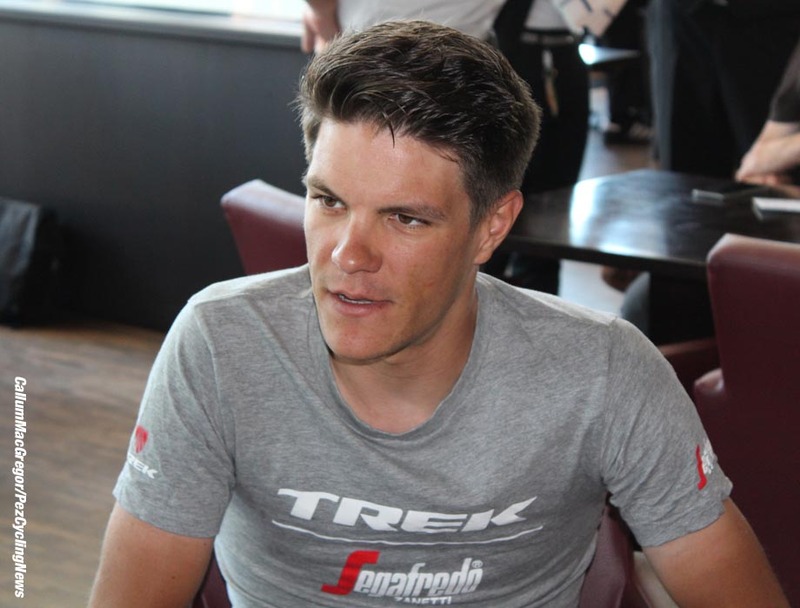 Jasper Stuyven: It’s pretty much as I expected, there’s a lot of pressure with the big crowds and Media attention; it’s a huge race but on a physical level I would say it’s about the same as the Vuelta. PEZ: Stage Two – a bitter/sweet day for you? 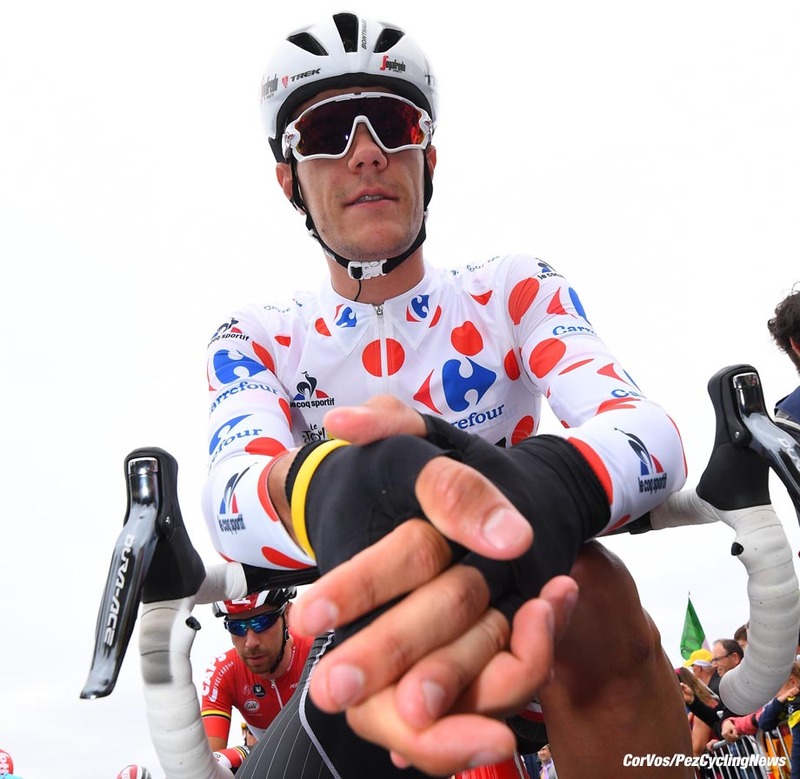 Yes, a good and bad day, even now, two weeks later I still think about it; it was nice to get the attention and the maillot a poids but I was so close to the stage win and the yellow jersey – that doesn’t happen every day and it’s very disappointing to think that I missed out by so little. As the race goes on and I see how big and hard it is I realise that whilst it was a good day, I missed out on a huge opportunity. PEZ: What’s been the toughest day for you? The Grand Colombier stage; that wasn’t a good day for me, the parcours was tough, I survived but tiredness finally caught up with me – let’s just say I’m happy to see this rest day! 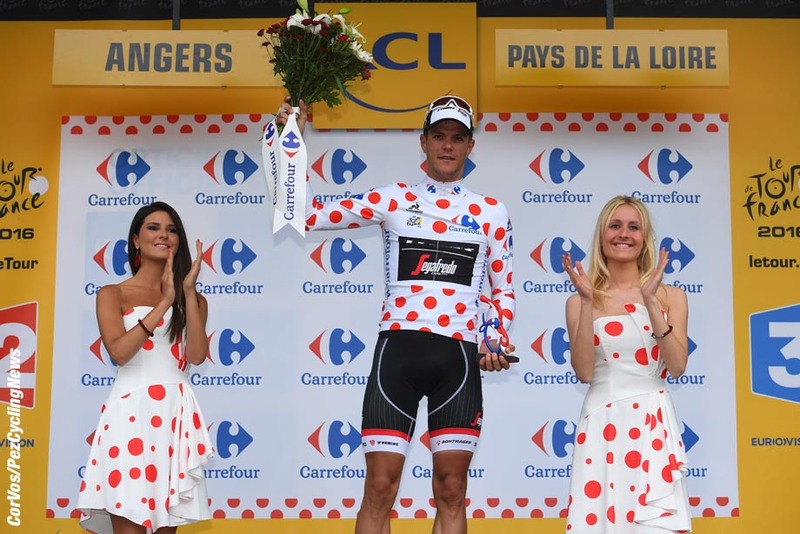 PEZ: Yesterday was ‘Fabian’s Stage’ was the team making a special effort for him into his home town? Of course we wanted to try hard for him but yesterday wasn’t a good day for him (the Swiss finished sixth, ed.) and it’s a pity I wasn’t on my best day either because I think it was a finish which would have suited me and we’d have had two cards to play. But of course we have Bauke Mollema well placed on GC and we’ve been using a lot of energy to protect him. PEZ: You were junior world road race champion in 2009 but unlike many who have won that race you’re progressing nicely. I just try to take it step by step, there are a lot of rides who haven’t progressed having won that – I think perhaps Ulissi (Lampre rider and Giro stage winner Diego Ulissi who won the junior title twice, ed), is the only one who has and I had a lot of people telling me that. People say these things and it instills doubt but I have just kept working with my coach – I think that in my pro career it will be better for the wins to come later rather than earlier. PEZ: You headed off to the USA, unusual for a Belgian rider? As world champion in Belgium when you're just a 17 year-old kid you’re under a lot of pressure – the Media expect you to win every weekend, even both days over the weekend. When Cadel Evans was world road race champion no one expected him to win bunch sprints but as world junior road race champion in Belgium you’re expected to win everything. I spoke to Axel Merckx and he understood – as a young pro he faced similar pressure and expectation in Belgium due to his name. The USA was a good opportunity for me to develop, away from the Belgian Media and having the opportunity to race against the World Tour pros in races like California and Utah. I was really happy during my time there, I did escape the pressure. PEZ: What about the US scene? It’s also hard – I mean a race is only as hard as the riders who are in it. I like racing there and still enjoy it, I’m very happy to go back to the Tour of California with the team. PEZ: I watched your Vuelta stage win – you had broken your hand in a crash that day. Before the Vuelta we picked out three stages I wanted to do well in; one of them I wasn’t going well, the second one the climb at the end was much harder than it appeared in the road book, so this was my last opportunity. I was motivated and focused that day, sure there was a little pain but you have to just get up and get on with it! PEZ: You were top ten in Het Nieuwsblad having been involved in a crash then won Kuune-Brussels-Kuurne the next day; no one has ever won both in the same year – do you think it’s possible? Everything is possible! I think perhaps a rider like Sagan or Van Avermaet is capable of it but much depends upon the weather; if it’s good conditions for Kuurne then it’s hard to beat the pure sprinters – you’d need cold and wind and rain. 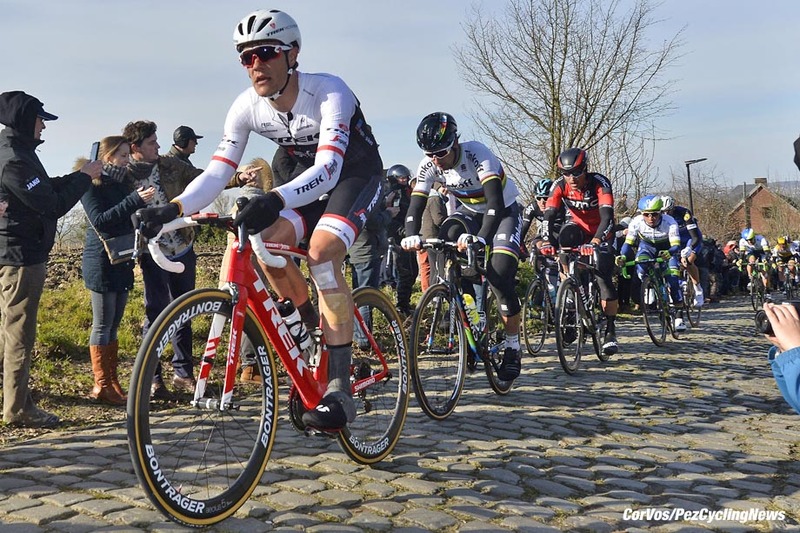 PEZ: After your Kuurne win did notice a change in attitude towards you from the Media and other riders? Not so much from the Belgian Media, more from the international Press, yes. As for the team, I was given my chance that day and I took it, so yes, I think I’ve stepped up a little within the team. PEZ: You’re studying for a degree in sales management, isn’t it hard to fit that in? So far, it’s going well – the big tests are stressful when have to learn what’s required to be ready for them but when it’s just studying it’s a good distraction to take my mind away from cycling. My friends from school who are outside of cycling are very important to me – there is more to life than just the bike. Yes, ‘the new Boonen’ or ‘the new Cancellara’ – if I achieve just one tenth of what those guys achieve then I’ll be happy with my career. I’m just Jasper, I want to have a nice career – keep improving step by step. PEZ: Do you have Olympic ambitions? No – the parcours doesn’t suit my characteristics. PEZ: And if you could win just one race? 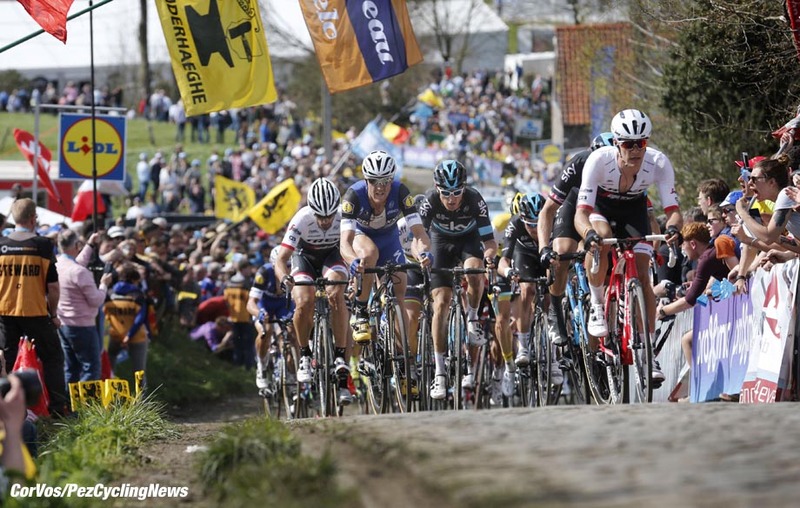 PEZ: Not Flanders, most Belgian guys say, ‘de Ronde.’? I know, but ever since I won the junior version of Paris-Roubaix whilst wearing my junior world champion’s rainbow jersey I’ve been in love with that race!